In this chapter I want to share with you a selection of useful and friendly accessories that work well for me in my vegan life. 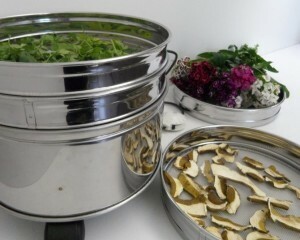 With the dehydrator, which dries foods with air at a temperature below 45° C, you can store fresh food by converting it into healthy dehydrated products that maintain their original nutritional properties. For example, snacks of dried fruit and vegetables to munch at a movie but also cookies and raw energy bars to delight everyone at home. A whole world to discover!